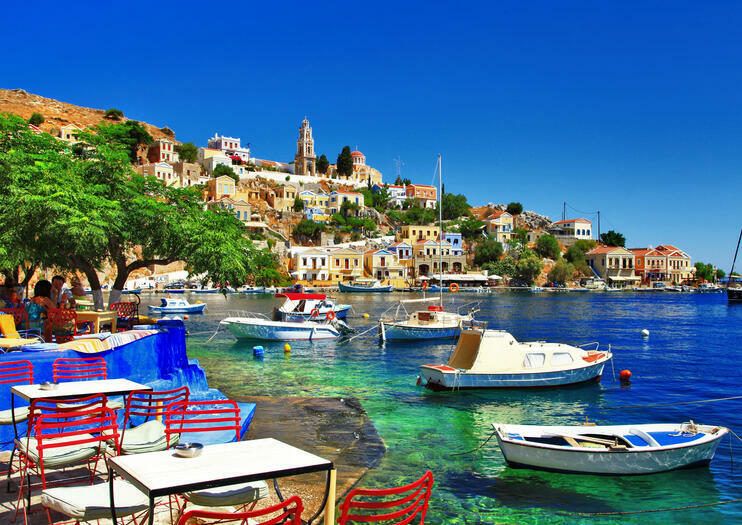 Arguably one of the prettiest Greek islands, Symi is only five km (three miles) east of the Turkish mainland and lies north of Rhodes in the eastern Aegean Sea. Its main settlement of Chorio is tucked around the fishing harbor of Yialos (or Gialos), and backs steeply up the surrounding hills in a jumble of pastel-hued Neo-Classical townhouses and churches topped with ornate spires. Fishing has been the most important industry on Symi for centuries and by night the cobbled streets of Yialos are given over to seafood restaurants serving up the day’s catch. The harbor is still full of traditional wooden fishing boats, bobbing among the taxi-boats that ferry visitors out to the safe swimming at sheltered Agios Nikolaos beach or the translucent waters of Nanou and Agia Marina, both perfect for snorkeling. Inland Symi is heavily forested, a walking and cycling paradise with several way-marked trails through pine and cypress trees, many giving spectacular views over the island’s inaccessible coves and others leading past hidden chapels and monasteries. The most famous of Symi’s monasteries is the Archangel Michael at Panormitis, which stands on the waterfront in a bay on the island’s southwest coast. The present Venetian-style complex dates from the 15th century and is centered round an elaborate bell tower. As well as a library of rare Byzantine manuscripts, the monastery has two museums displaying gleaming Orthodox icons as well as traditional fishing and farming implements. Thanks to its sheltered bay, Panormitis is also one of the most popular moorings for charter boats as they sail the Dodecanese Islands; Pedi Bay on the northwest coast is also a magnet for yachties. Symi is an hour north of Rhodes by ferry; there are also daily ferries from Kos in the summer. The Monastery of Archangel MichaelatPanormitis is open daily 7am–8pm. Its museums (admission €1.50) are open Apr–Oct 8.30am–1pm, 3–4pm. Experience Symi, one of the most striking islands in the Aegean, on an all-day cruise. Enjoy sightseeing at the St. Michael Panormitis monastery and exploring Symi village. This convenient, budget-friendly outing includes hotel pickup and drop off in Ialyssos and Ixia and offers plenty of free time for relaxing and swimming or shopping and dining. When staying on Rhodes, take a full-day detour to another gem of the Dodecanese islands with this day trip to Symi. After being welcomed by the port’s brightly colored neoclassical homes and fishing boats, tour the winding streets of Yalos with a guide and climb to the ruins of St. John’s Fortress for spectacular sea views. Later, set sail for the Panormitis Monastery, known for its sacred icon of the Archangel Michael. Discover idyllic Symi Island on a day trip from Rhodes, starting with a ferry boat ride. Cruise across the Aegean Sea to the mountainous isle with your guide, who accompanies you on a stroll alongside the waterfront before you set off on your own to explore the charming harbor independently. Follow up with a short cruise over to Panormitis Bay where you can choose to visit the Monastery of the Archangel Michael during ample free time. Finish with the return trip to Rhodes. Escape to the dreamy landscapes of Turkey’s Aegean coast for an unforgettable 7-night cruise around the Bodrum Peninsula and the Greek Dodecanese Islands. Board your yacht for an all-inclusive trip, stopping at Kargi, Bozburun, and the Greek Islands of Rhodes, Symi and Kos. Hop off to explore the ancient city of Knidos, hike the Nisyros volcano or sample the buzzing nightlife of Kos, or simply enjoy swimming, sunbathing and snorkeling as you float around the coast. Every day, more and more people are discovering the magic of a Blue Voyage on the Mediterranean Sea , Aegean sea and greek islands.Picture a full-service hotel where every room has a sea view and the scenery changes constantly: enjoy a real treasure of coves,inlets,bays beaches and small coastal towns and villages. Add the all inclusive option to this, and you have the perfect holidays!Avoid the worries of having to make dinner or keep track of your bar bill or make reservations. An all inclusive cruise allows you to lie back and be completely pampered. Cruise your cares away!